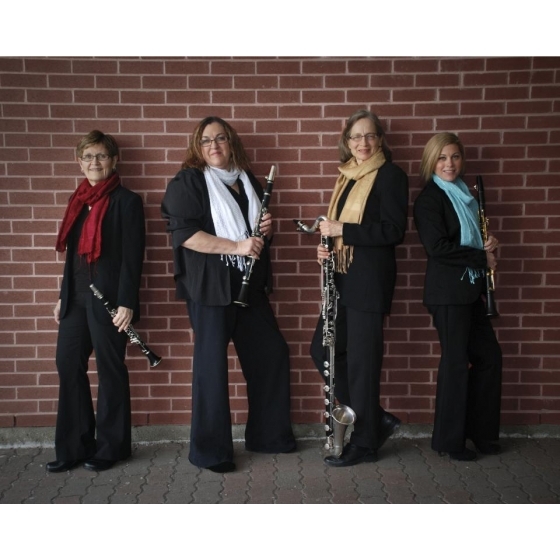 Drawing their name from the nickname for the clarinet -the "licorice stick" -and the fact that they play "all sorts" of music, the Licorice Allsorts Clarinet Quartet has been delighting audiences of all ages since 1980 with entertaining and informative programs. The group performs in schools, libraries, art galleries, universities, churches, and community centres, and for audiences of ages 2 to 102. The programs of light classical and popluar music are suitable for a variety of situations such as receptions, dinners, special events, and celebrations. The Licorice Allsorts' repertoire also includes three delightfully engaging and interactive programs for ages 2 to 8, each specially designed to take the audience on a mesmerizing journey of storytelling and music. The Three Billy Goats Gruff : A beloved children's classic is brought to life with a musical adaptation by English composer Paul Harvey. TheThree Musical Pigs and the Wolf: Bach, Mozart, and Beethoven are three music-loving pigs. Although the sneaky wolf Hugo tries very hard to catch them, he is no match for the pigs' speed and intelligence. However, there is a happy ending, and of course, music plays a key role in that! Spring Into Spring: The quartet's newest program includes a story, music, poetry, and movement to welcome back the warm weather. "The Song of Spring" by Annie Willis McCullough is adapted by the group to include audience participation and spring music by Vivaldi, Mendelssohn, Schubert, Glazounov, Rimsky-Korskov, Grieg, and Berlin.